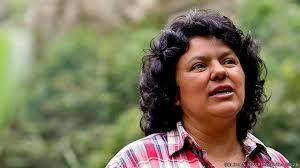 On March 3 2016, human rights and indigenous leader Berta Caceres was assassinated. Berta’s martyrdom now serves as a global symbol of the struggle for freedom and democracy as colonized peoples world-wide languish beneath the yoke of imperialism. Berta’s death is also a symbol of Canada’s criminality. In 2009, a western-orchestrated coup deposed the democratically-elected government of Manuel Zelaya. Not long after the illegal coup, Canada ratified the Canada-Honduras Free Trade Agreement, (euphemistically titled, “Canada-Honduras Economic Growth and Prosperity Act”) with the criminal progeny of the coup. Zelaya’s promise of a moratorium on extractivist mining activity was quickly denied, and Honduran aspirations for freedom, human rights and democracy were smothered. “Mr. Speaker, let me be clear. There are three fundamentally important criteria for assessing the merits of trade agreements. First, does the proposed partner respect democracy, human rights, adequate labour and environmental standards, and Canadian values? If there are challenges in these regards, is the partner on a positive trajectory toward these goals? Second, is the proposed partner’s economy of significant or strategic value to Canada? Third, are the terms of the proposed agreement satisfactory? Yet, despite – or rather, because of these failings – the exploitative agreement was passed, thus guaranteeing an entrenchment of oligarch rule in the asymmetrical Honduran economy where the rich get richer and the poor get poorer. Increased GDP does not “trickle down”. “Most recently, Berta was killed (…) by the U.S. and Canadian backed military coup in June 2009, that ousted a democratically elected government and brought back to power the same elites that for so long have dominated and abused Honduras; who – once back in power – took all the above and made it worse again, who use repression as a tool of societal terrorism and control, hiring sicarios to target and kill so many hundreds of people since the coup, people like Berta. “Bertha Isabel Caceres Flores, a leader of the Lenca Indigenous people, is General Coordinator of the Civic Council of the Indigenous and Popular Organizations of Honduras (COPINH). A Chinese hydro-electric project is imposing itself on the ancestral lands of the Lenca Indigenous peoples, and her community is fighting for the right to free, prior, informed consent, as guaranteed by the United Nations Declaration of the Rights of Indigenous Peoples (UNDRIP). Flores and her family have already received very credible death threats — her colleague, Thomas Garcia, was killed — and she is at the top of a government ‘Kill List’ which includes her lawyer. Transnational and domestic oligarchs are crippling Honduras, scuttling in the dark like rats, gnashing their teeth, always wanting more, but beacons of light still pierce the Honduran darkness, bravely proclaiming Life and Justice, and Berta’s brave soul is surely amongst them. Berta Caceres’ light is shining in Syria (and globally) as well. In Syria, indigenous (Syrian) peoples are taking a stand for life and liberty, and against the West’s mercenary proxies who are destroying the country. The direct consequences of the destruction of countries targeted by the West, including human trafficking and mass migrations, are not acknowledged by the imperial perpetrators. Rather, the victims are blamed, so the cancerous cycle repeats itself over and over, beneath the cover of racism. Democracy, prosperity, and the rule of law in Honduras would stem the flow of desperate migrants fleeing the country, yet the Western foreign policies of supporting illegal coups and transnational corporate rule frustrate these aspirations. The same can be said of Syria, Libya, Iraq, or any other country invaded by Western powers. Illegal imperial destabilization of foreign countries creates chaos, poverty, crime, and floods of refugees. Yet these root causes are invariably, and conveniently, ignored by mainstream media, which has devolved into being little more than a propaganda arm for Western warmongers. As with Honduras, the West vocalized its support for international law, the sovereignty of nations, and democracy, but it practiced the opposite by seeking to illegally oust the democratically-elected, and hugely popular, President Bashar al Assad – Zelaya’s counterpart. The same criminal strategies were perpetrated in Iraq, and Libya, to name a few examples. We are the Axis of Evil in these desperate times of life and death, dignity and despair. But Berta’s light will not be extinguished. It is with the peoples of Iraq, Libya, Syria, and all imperial-ravaged countries throughout the world. Her light will be a companion of freedom and justice everywhere.